Star of Bethlehem. This is a very large family of bulbs that includes the non hardy Chincherinchee but only a few are suitable for the UK garden. They have small spikes of green backed white flowers. 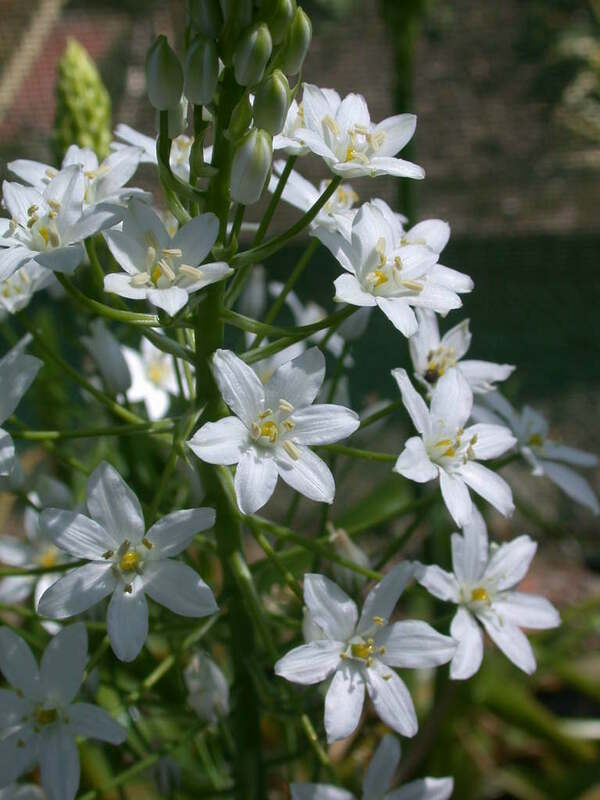 Ornithogalum nutans can be natuaralised in grass under trees. Stunning bulb with heads of large, glistening white flowers. Quite spectacular in flower. Comes from the beaches of S Spain so requires a dry sunny position or it is easy under cold glass. Dry summer dormancy. Tall slender spikes of up to 75 glistening white flowers. Perfect to add a splash of colour in early summer. Excellent in the RHS garden at Harlow Carr growing around the trunks of white birches through variegated grasses. Well drained soil.